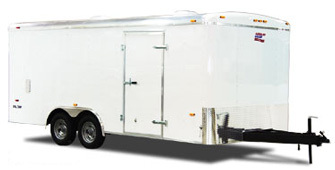 Whether you are looking for the smallest 4’x6’ economical trailer for your light-weight personal hauling and storage needs, a heavy-duty 8.5’x53’ gooseneck trailer to haul your race car, tools, and equipment, or something in between to haul your motorcycles, four wheelers, or snowmobiles, we have something for every need. Swan Creek offers aluminum and steel-framed trailers with standards ranging from spring to torsion axles, and double rear doors to ramp doors. The options available for upgrade are endless, keeping the basic trailer affordable. Of course, the standards on every trailer show off the quality that we are proud to represent!